This week two elements have collided and produced a whole new adaptation of an OSR-style game. On the one hand, inspired by my desire to blend the best elements of Castles & Crusades with Monsters & Magic, I found the time to draft the basis of something new: UbiquitousFantasy. On the other hand, inspired by the emails of one of my keen players, I've been seeking to further develop the fantasy world that we're currently playing in. Taken together, with a big dose of effort on my part, I've managed to put together something that excites... and which I hope will excite my players. We've been playing Castles & Crusades for a few months now. It's great: easy to play, easy to learn, lots of good and solid material. We like. Except that, having upgraded to Level 2 and being well on the way to Level 3, my players commented that there are really very few benefits from levelling up: in other words, it's a bit bland. That got me nervous about the longevity of playing this system. Plus there's that pesky d20. 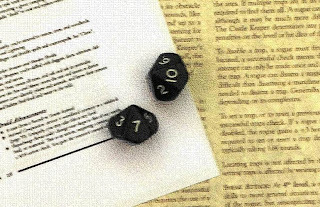 Regular readers will probably realise that I don't like the randomness of rolling one die for action tests. For a long, long time I've fancied trying out 2d10 instead of 1d20... so yesterday, in a fit of creative energy, I wrote that into our house rules. That was how it started. While I was in the process of writing house rules, I thought, why not introduce some of the other things that I've been mulling over for a while... and solve that blandness problem to boot? Inspired by Sarah Newton's ideas about Traits, I've modified the way adding the Level bonus works: in short, you get it when you invoke a Trait from your Race, Class or Personal Background. Taking things further, and inspired by the conversations with players, I also decided to re-write the classes to fit this change... and to introduce some Specialised Classes (or, to use another term, some Sub-Classes) which are customised to our fantasy setting. It was easy to do... and a lot of fun! Now we have options for a Lightbringer Paladin, a Ranger of the Wild, a Brotherhood Assassin and a Lightbringer Witchhunter. Each blends elements from both the C&C and M&M classes into something... different. Finally, at least for now, I decided to adopt the idea of an Invocation Test for the Clerical Miracles (my new words for, "making a magic test to cast a clerical spell"). This forms the basis for a cool rule on organising Rituals with many participants and miracles which are upgraded by particularly high Invocation rolls. Tikhon is a popular saintly name in the Russian Orthodox Church, meaning "hitting the mark". As the setting we're playing in has been doing just that with the group, it seemed a cool name for the world. Welcome, therefore, to Tikhon. On top of this, working with the players on their character backgrounds, I've been gathering more and more detailed material for the world. As the players work with me on creating the setting, it is long overdue to codify what we have so far. Thus, this weekend, I'm beginning just that process - typing up the notes. What's cool is that their ideas, as players, are fuelling my creative process... in truly collaborative style we are producing something far more interesting than might have been expected. Combining this creativity with a desire to customise the game to fit the setting, rather than forcing the setting into a generic rule set, is not necessarily innovative... but it is something that I've never managed to do before. I've even gone as far as to commission a map for the area we've been playing in. There's a massive risk involved in all of this: it might not work as well as we hope. The challenge, at least for me, is to be brave and bold. If past gaming failures have taught me anything it's that you can't keep doing the same things over and over, hoping that something will click. What has made the one-off Hunt for Gerulf adventure turn into the birth of the World of Tikhon has been boldness: a decision to wing a game off of a one sentence premise gave us Mortenburg and Gerulf's Raiders; another decision to introduce clues to the Moon Gate led to the birth of a conspiracy tale. The courage to listen to the players is leading me into a brand new and exciting setting, played with some customised house rules. What's next? Well, next week's session is looming... will this all pay off? Fingers crossed... but you can't go through life wondering what might have been, can you? I reckon it's much more fun to risk failure on the opportunity of creating something really cool.